Adash A4900 Vibrio M NEW ! 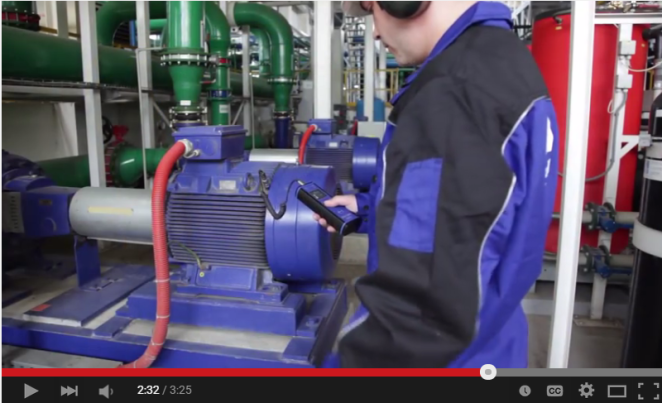 A4900 - Vibrio M is an innovative equipment for machine monitoring. It is powerful, but very simple in use. Traffic light is used to indicate the severity level; and ISO 10816-3 rules are included. What can A4900 Vibrio M do for you? 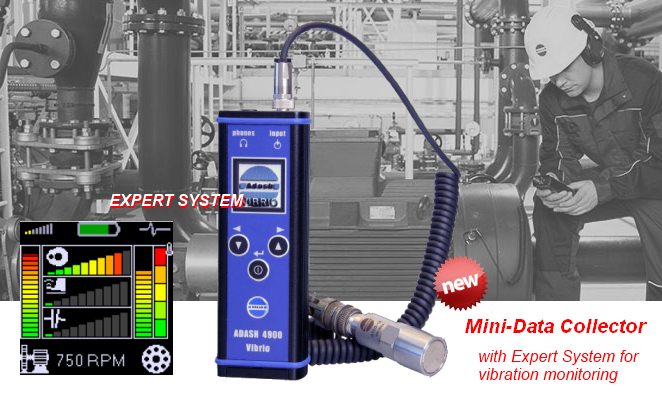 Trending of vibration (Data Collector Option) ... NEW!! 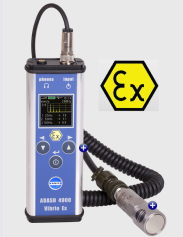 With the Data Collector (option), the function of Vibrio M is expanded from an Expert Vibration Meter into a basic Data Collector. Data (overall, time, spectrum...) can be stored in its memory and downloaded to the PC software DDS2014 for trending and further analysis. With the software DDS2014, user can manage all the vibration data in its database; and setup the route for routine data collection. 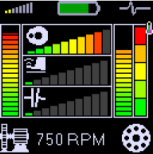 The build-in stroboscope inside the A4900 Vibrio M represents the unique innovation in the handheld vibration equipment. High intensity LED is used. A4900 can automatic detect the rotating speed of the machine and freeze the movement by setting its flashing frequency the same as the rotating parts. 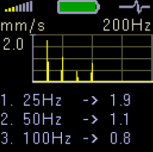 Frequency can also be set manually. The traffic light on the left (vertical) indicates the overall vibration severity against the ISO10816-3. The traffic light on the right (vertical) indicates the bearing condition using vibration level; and temperature.using its infrared sensor. 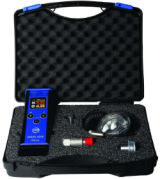 A4900 measures the RMS vibration level; and compare with the severity limits of ISO10816-3. Readings changes in Traffic Light color when exceedance. Bearing temperature is measured by infra-red and indicated in traffic light. 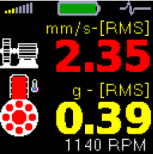 Overheat of bearing can be easily identified in RED bar as shown in the figure (left side). Temperature reading is shown in another screen. 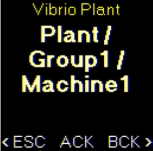 A4900 Vibrio M also display the vibration time signal. 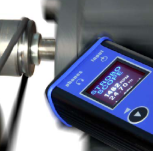 You can visualize the vibration impact due to bearing fault by looking at its time signal. 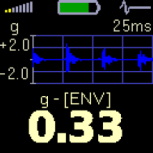 It is useful in differentiating whether the increase in g-ENV is due to bearing fault or just lack of lubrication. A4900 Vibrio M measures the FFT spectrum; and list out the most dominates peaks. The information is useful for detection of unbalance and looseness. DDS2014 for Vibrio M - NEW!! With the data collector option in Vibro M, data stored in route or off-route can be transferred to the DDS2014 PC program. DDS2014 is a monitoring database program that extends the Vibro M in trending and diagnosis functions such as time waveform, spectrum and envelope analysis.